The Curse of Fenric is a four part story of popular sci-fi show, Doctor Who, starring Sylvester McCoy. The Doctor and his companion, Ace, arrive at a secret military base during World War II where a Viking curse has been awakened.. Confronted by vampires emerging from the sea and Russian commandoes closing in, the Doctor and Ace need to find a way to defeat an old evil to secure a better future for mankind. 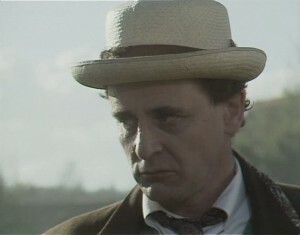 Sylvester McCoy (Frank Stubbs, Rab C. Nesbitt) stars as the seventh Doctor alongside Sophie Aldred (Corners, Melvin and Maureen’s Music-a-grams), Dinsdale Landen (Devenish, Mickey Dunne), Alfred Lynch (Jackanory, West 11) and Nicholas Parsons (The Arthur Haynes Show, Sale of the Century). The production visited Lillesden Manor which doubled as the laboratory under the church. It is situated in Hawkhurst and is set in 200 acres of land, and was built in 1853 by Edward Lloyd. Just after World War I, the mansion was sold and became a girl’s school which closed in 1999. 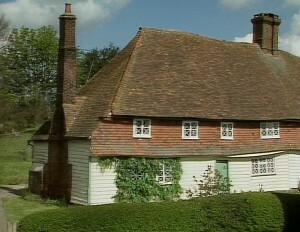 The production also visited listed timber framed cottage, Roses Farm in Hawkhurst, which doubled as Mrs Hardaker’s Cottage and St Lawrence Church in Hawkhurst which doubled as St Judd’s Church. Doctor Who: The Curse of Fenric was first shown in 1989 and is now available to buy on DVD. 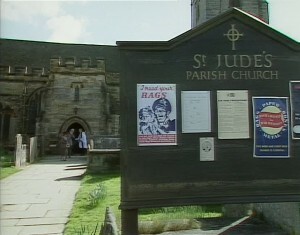 This entry was posted in Filmed in Kent and tagged Doctor Who - The Curse of Fenric film locations, Lillesden Manor, Roses Farm, St Lawrence Church in Hawkhurst, Sylvester McCoy, TV Drama. Bookmark the permalink.